Gallery hours: Open daily 12:00 - 6:00 p.m. and Thurs. until 8:00 p.m. Opening reception, 5:30 - 6:30 p.m., and panel discussion, 6:30 - 8:00 p.m.
Art, Media, Research, and Advocacy: What Shapes Public Opinion and Drug Policy? There are about 23 million people in the United States who have successfully resolved a problem with drugs or alcohol, but we rarely see or hear their stories compared to depictions of addiction in media, art, music, and film. 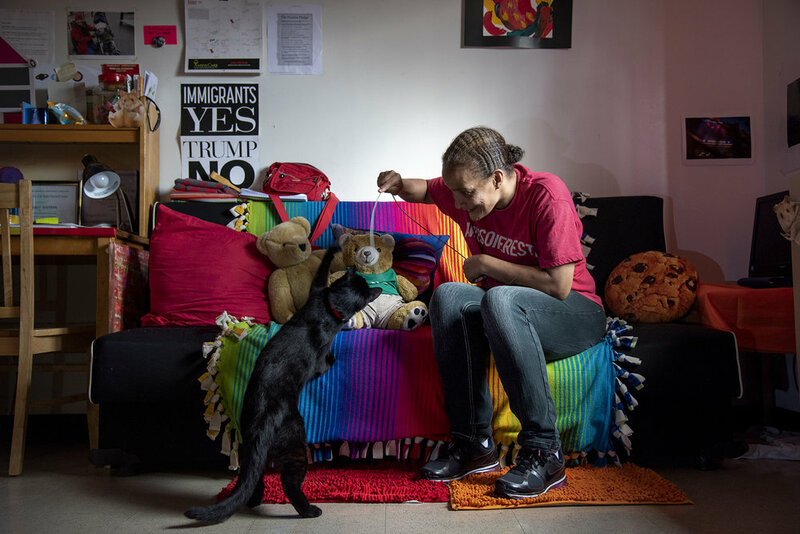 Although not everyone identifies as being “in recovery” and many people can’t publicly acknowledge their past because of stigma or the consequences of admitting illegal drug use, a growing movement is working to offer examples of success and hope to those still struggling with addiction. The goal of this exhibit is not just to show that recovery is possible, but also to highlight some of the ways people have rebuilt their lives: reconnecting with their families, finding rewarding work, and developing meaningful relationships with partners, peers, and others who offer support. We also wanted to feature some of the treatment providers and harm reduction services that many people rely on, often at times when they feel isolated and overwhelmed. Recovery is rarely a solo journey and it usually involves setbacks and hurdles, but the more we talk about it, share ideas, and embrace different paths, the more people will find their way. Many of the contributing artists in this exhibition have personal experience with addiction and recovery, while others have worked closely with the people whose stories they documented through long-term collaborative projects. A multi-dimensional collaborative work focusing on the story of one woman and the intersection of sexual trauma, mental illness, addiction, and recovery. Photos of people, events, activism, and art from this community center at the height of the HIV/AIDS epidemic in the early 1990s. Portraits of John's extended family and friends exploring the socioeconomic and familial factors that impact addiction and recovery. Images and text juxtaposing Yannick's first day on methadone with how he felt after a year of treatment. Photos of a young woman Tony met who asked for help getting into a rehab program, which enabled her to escape life on the street. Spoken word pieces and images commenting on Paul's past drug use and his life now in recovery. Artwork John created in a program that helps participants use art as part of a therapeutic process to address drug and alcohol problems. Photos of supporters of the harm reduction movement paired with handwritten responses to question prompts. 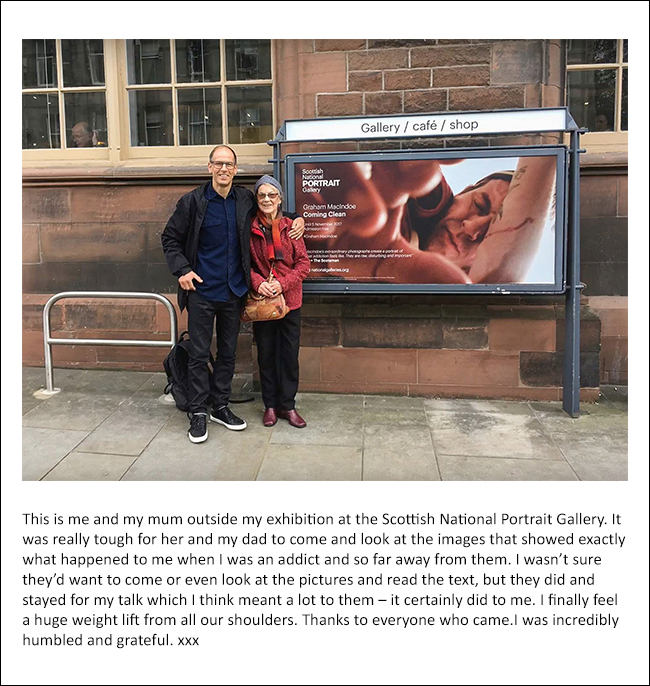 Instagram and Facebook posts reflecting on Graham's addiction, incarceration, and recovery, which have inspired others to share their experiences as well. 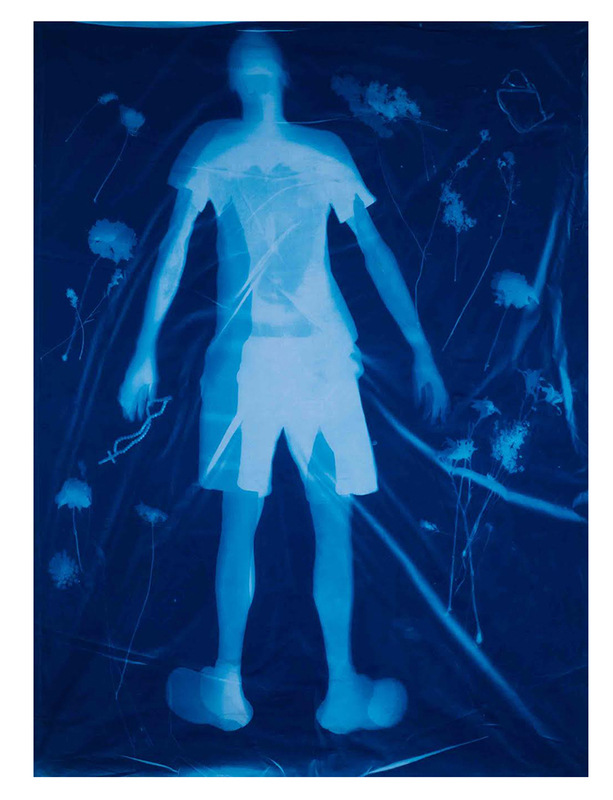 A cyanotype portrait banner of Richard, who tends to a garden in the Tacony neighborhood of North Philadelphia as part of his recovery from addiction. Photos taken by clients Neil asked to document the people, places, and things they identified as meaningful for their recovery. Supervised by Graham MacIndoe and Julia Gorton, assistant professor of communications at Parsons. An interactive experience inviting visitors to respond to open-ended questions about what recovery means to them by writing their thoughts on wall panels and postcards. An animated projection that replaces derogatory terms associated with people who use drugs with positive identities, to show that no one should be defined by negative labels. An interview addressing student substance use, addiction, harm reduction services, and rehabilitation based on insight from those who have direct experience with this issue. A project that uses stenciling to reframe our notion of recovery by allowing viewers to re-evaluate the world from a different perspective. 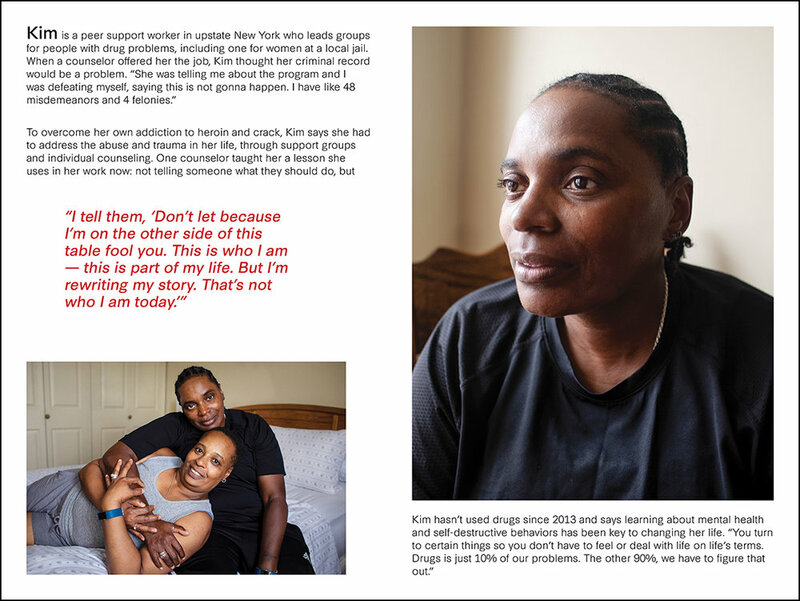 Thanks to: Luke Hayman and Elyanna Blaser-Gould at Pentagram Design, Hashem Eaddy at Parsons, The National, Open Society Foundations Global Drug Policy Program, and everyone who worked with the artists and shared their stories. Graham MacIndoe is a photographer and assistant professor at Parsons and Susan Stellin is a reporter and adjunct professor in the Journalism + Design department at The New School who recently completed a master’s in public health at Columbia University. They have collaborated on various projects combining interviews and photography, including exhibitions, talks, and a memoir documenting Graham’s addiction, incarceration, and recovery. Submit a question for the panel discussion on April 9.